At Safety Fabrications, we pride ourselves on making our Customers’ access and safety visions a reality. We achieve this by understanding their fall protection and access needs, and ensuring we have their approval from design through to the finished fabrication. Our commitment to quality echoes that of our Customers who excel in providing quality products to their customers at a cost-effective price. Here at Safety Fabrications, we produce CE Marked Fabrications and all of our products are manufactured in accordance with BS EN ISO 3834-2:2005 and BS EN 1090-2:2008. From 1 July 2014 it became mandatory for construction products, which fall under the scope of the Construction Products Regulations (CPR), to make a declaration of their performance and to carry the CE accredited fabrication mark demonstrating conformity with the declared performance and compliance with applicable regulations relating to union harmonization rules, before they can be put on the market in the EU. As structural steel components are safety critical, CE Marking to BS EN 1090-1 requires that the component manufacturer's factory production control (FPC) system is independently assessed and certified by a body notified to the European Commission by the appropriate national agency (DCLG in the UK). 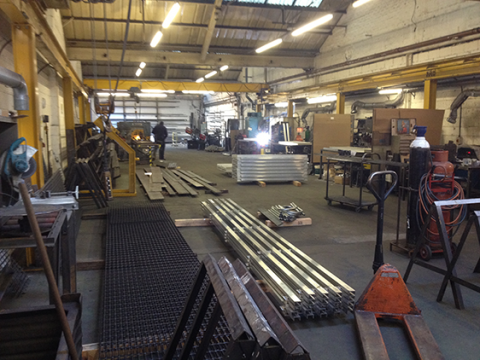 Based in Sheffield, South Yorkshire, at the heart of the fall protection industry within the UK, Safety Fabrications work out of an 8,000 sq feet workshop and storage warehouse, complete with 2 large cranes. The Fabrication shop is just a few miles from the M1 motorway, which allows for easy access & delivery across the country. Over the years our knowledge and technical expertise has grown through working on many steel projects which can be found in our case studies section of the website. Our staff are fully trained in the art of design and manufacturing. So with the combination of technical equipment, skilled staff and delivery vehicles, we can design, build and deliver complicated requirements within a short time period. Safety Fabrications prides itself on exceptional customer service and is committed to its promise to deliver, quality steel fabrications, on site, on time. Please feel free to contact our enthusiastic team to provide you with any additional information you may require.